As I was writing my last HootSuite post, I called Dave Olson (Dir. of Community and Chief Owl Wrangler at HootSuite) to check on the BlackBerry app, he told me that the BlackBerry app would be available for download and have a post of its own in mere moments. Dave, always a truthful guy, was bang on so I was able to give you the BlackBerry mobile download page seconds after it was live and be able to give you a first look at HootSuite for BlackBerry. 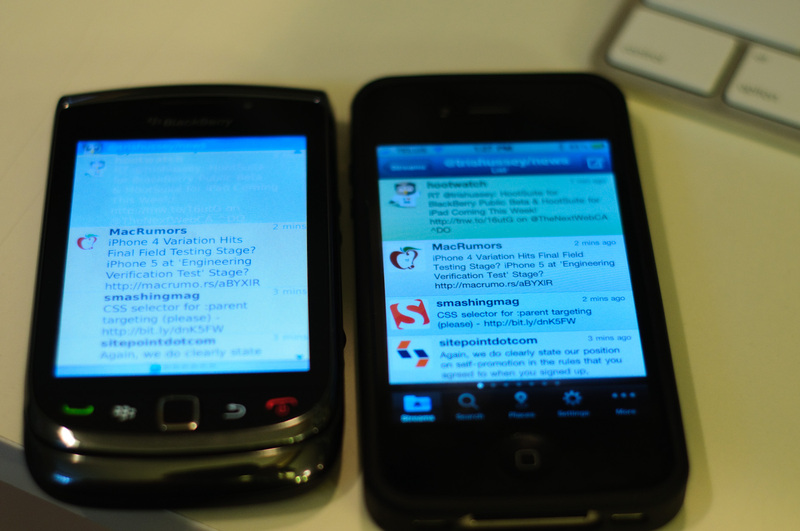 Looking at the app, you might think you’re looking at the Android or iPhone app. I was certainly impressed at how closely the apps resemble each other. On the Torch I’m testing, HootSuite starts up immediately (I made sure I loaded the OS 6 version) and quickly imported all of my HootSuite settings from my main HootSuite account. I could check out the timelines for all the TNW accounts I have access too. After being on an iPhone for so long, I forgot all about the Menu button to get to things like being able to compose a tweet (or hoot), edit the tabs and manage accounts. Editing tabs is an easy process, but just confusing if you’re not used to the new BlackBerry touch button (instead of the trackball). I found the app a little sluggish to restart when I first loaded it, but after a few minutes, the apps seems to be getting faster at restarting. I think that might because it’s loading more of the data in the background. One feature I missed right away from the BlackBerry app that is in the iPhone app is the Places feature. I checked the Accounts area and sure enough, I could add Facebook, but not Foursquare. 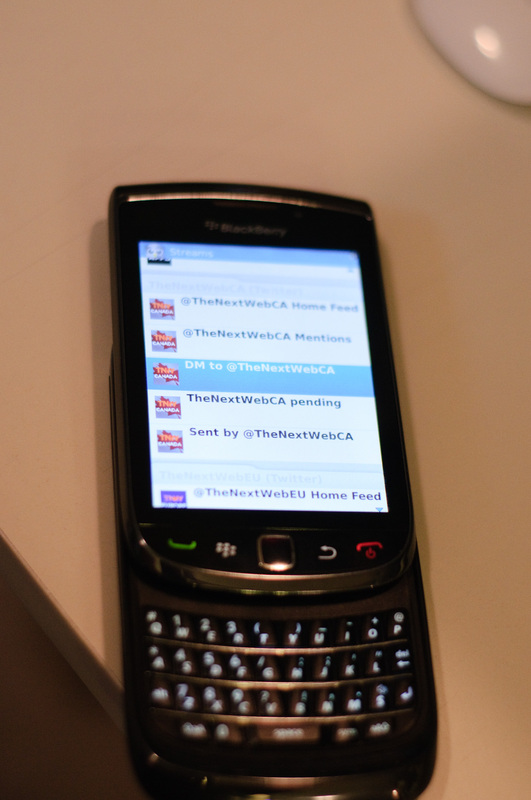 I’m going to guess that this is a feature that might be coming soon to the BlackBerry app. 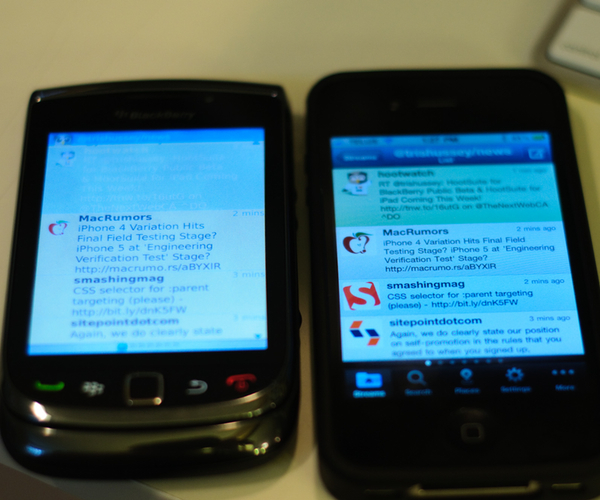 From my short time using the app, I think it’s a very strong Twitter app for BlackBerry. Personally I think UberTwitter should be worried, because HootSuite offers a lot of bang for the buck and has a much easier way to get into your Twitter lists and other features. 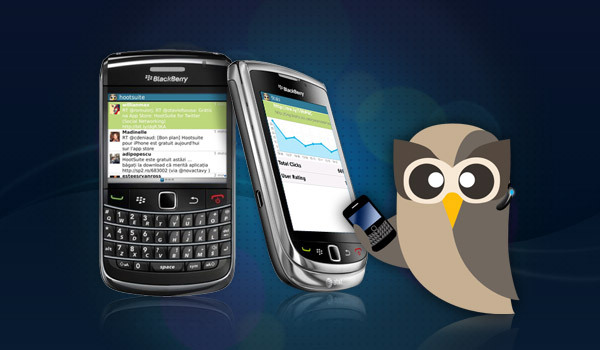 If you’re using a BlackBerry, I think HootSuite Beta should be a no-brainer download to try. I loved UberTwitter, but the nice, familiar interface of HootSuite wins me over straight away.